When you go to this amazing villa in Begur you will arrive in an oasis of lush green. Typical for the area are the many, big pine trees scattered in the garden. 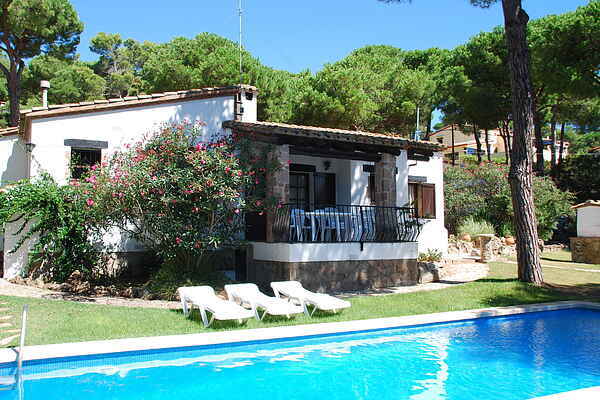 These offer nice shaded areas for the villa, garden and even the lovely private pool. You don't have to worry, the sun is also more than present throughout the day. For your daily groceries you can go to the supermarket only 500m away. Handy! Although the surroundings don't immediately remind you of the Costa Brava, 'the wild coast', it will soon become clear. Only 3 km away, you can find the characteristic little bays and beaches of the costa. If you walk 1,5 km further on, you will find yourself in amazing Begur. Allthought the Moorish burrow dominates the area, there is still a range of fun little shops, especially great restaurants, terraces and clubs to form a nice counter part. Begur is centrally located. Nice to visit is the medieval centre of Pals (6 km). Golf lovers can also go here to play a game on one of the golf courses. Palafrugell (5 km) has a lovely market where you can stroll and browse to your heart's content. If you go north, you will soon reach diving hot spot Estartit. Heading south you will find charming Palamós and Calonge close by.